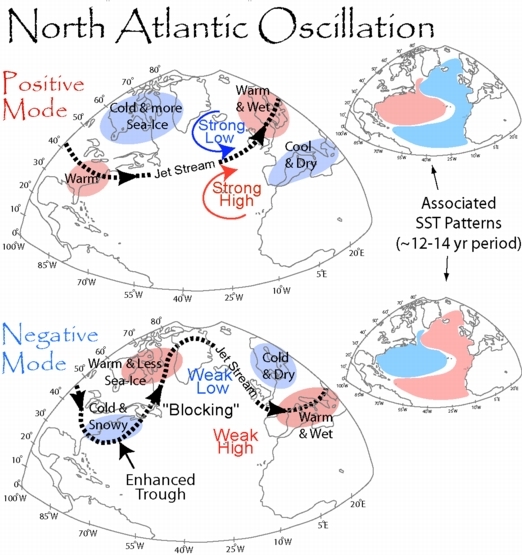 A new paper published in Geophysical Research Letters finds the natural North Atlantic Oscillation [NAO] controls temperatures of the Northern Hemisphere 15 to 20 years in advance, a lagged effect due to the large thermal inertia of the oceans. The authors find the NAO index can be used to predict Northern Hemisphere mean temperature multidecadal variability and the natural oceanic Atlantic Multidecadal Oscillation (AMO) 15–20 years in advance. A simple linear model based upon this theory predicted the 'pause' of global warming since about 2000 that IPCC models failed to predict, and projects Northern Hemisphere temperatures will "fall slightly" over the 15 years from 2012-2027. The NAO, in turn, has been linked to solar activity. The twentieth century Northern Hemisphere mean surface temperature (NHT) is characterized by a multidecadal warming–cooling–warming pattern followed by a flat trend since about 2000 (recent warming hiatus). Here we demonstrate that the North Atlantic Oscillation (NAO) is implicated as a useful predictor of NHT [Northern Hemisphere Temperature] multidecadal variability. Observational analysis shows that the NAO leads both the detrended NHT [Northern Hemisphere Temperature] and oceanic Atlantic Multidecadal Oscillation (AMO) by 15–20 years. Theoretical analysis illuminates that the NAO precedes NHT multidecadal variability through its delayed effect on the AMO due to the large thermal inertia associated with slow oceanic processes. A NAO-based linear model is therefore established to predict the NHT, which gives an excellent hindcast for NHT in 1971–2011 with the recent flat trend well predicted. [Northern Hemisphere Temperature] NHT in 2012–2027 is predicted to fall slightly over the next decades, due to the recent NAO weakening that temporarily offsets the [theoretical] anthropogenically induced warming.